The perception of stereochemistry. A challenging case. 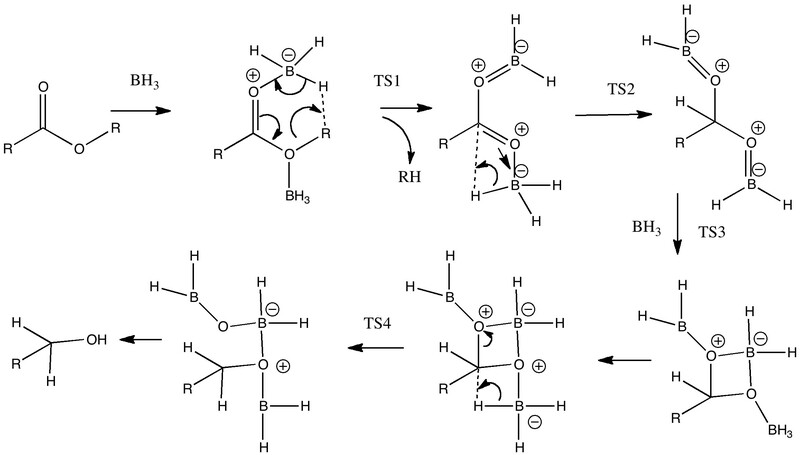 TS1 in this scheme is modified from before to include an extra borane coordinating to the oxygen of the O-R group. I will include here the intrinsic reaction coordinate [computed at ωB97XD/6-311G(d,p)], since it shows some fascinating features. One notes that the barrier for extrusion (R=H) is lower than before, due to the effect of the extra coordinated BH3 group. But notice the “bump” at an IRC value of ~4.0. If one inspects the gradients along the IRC, they reveal that the ejecting H-H molecule is tempted to coordinate to the boron to form a 5-coordinate species (a “hidden intermediate”) before abruptly changing direction and flying off into space! What happens if R=Me (an ester)? Well, the activation energy is now closer to 40 kcal/mol, which means the rate of the reaction would be very slow. Notice the bump corresponding to 5-coordinate boron has now vanished! Again, a link for IRC animation of the reaction (it is rather nice, even if a say so myself). QED? Well, not quite. One still has to show that TS2 – TS4 do not control things! The IRC for TS2 (the first addition of a hydrogen to the carbon) is shown below, again with fascinating bumps along the way. The TS2 animation is here. The free energy of TS2 is 6.9 kcal/mol lower than TS1 (even though the actual activation barrier is higher), which makes the latter the rate determining step. Note the bumps at IRC = -8 and +5. These are due to rotations setting up the reaction. TS3, a ring closing reaction (animation) shows an unexpected feature which I leave you to discover for yourself. TS4 is the second and final addition of a hydrogen to the carbon, with animation and resembling an SN2 inversion. The reaction is completed by hydrolysis. The relative free energies of TS1, 2, 3 and 4 are respectively 0.0, -6.9, -35.0 and -19.4 kcal/mol, which makes the overall rate limiting step TS1. If that is the case, then this explains why borane reduces only a carboxylic acid and not an ester. Now all I have to do is explain all of this to my tutorial group! Mind you, this is a deceptively complex mechanism, and who knows if it may yet spring surprises. This entry was posted on Sunday, October 16th, 2011 at 4:59 pm and is filed under Interesting chemistry. You can follow any responses to this entry through the RSS 2.0 feed. You can leave a response, or trackback from your own site. Very interesting! I also believe blogs could and should be considered as scholarly outlets of results, at least in the form of a pre-print server. Unfortunately we -our jobs- are still evaluated through metrics such as IF and such. Anyway, your post resonated with me because we’re currently trying to find a home for a mechanistic paper we just wrote; the thing is that this reaction has low aggregated value (aromatization of pyridinylidenes into pyridines) and also the reaction is unobserved! so therefore our paper deals with the rationalization -in terms of their electronic structure and calculated reaction barriers arguments- behind this absence of reactivity. Do you have any advice on how to ‘market’ it? About 100 million molecules are known or described, and perhaps in the region of about 5000 properties could potentially be ascribed to each of them. Annotation of this matrix, down to perhaps an individual molecule and a small number of its properties, could be considered a very valuable and appropriate crowd sourced activity. But as you say, the standard formula for progressing a career does not readily accommodate such. Only a very few have succeeded by following such different paths; I would include Jean-Claude Bradley as an example; he promoted Open Science, and was widely recognised for this activity. I would suggest however that the traditional route can be combined with innovative new ones, such as e.g. contributing a mechanistic analysis for a particular reaction in an open manner (for example a blog), although there is a risk that some may see the latter as distracting from the former. I would note in regard to blogs that an organisation called The Winnower offers the opportunity to publish e.g. a post in what might be described as a semi-classical manner. Whether initiatives such as this will succeed in reconciling the standard career path with blog-publishing and other genres of crowd-sourcing and open science remains to be established. But we will not know unless we try. I never really understood how borane reduces carboxylic acids to alcohols, thank you very for shading some light on that. The first of these actually contains the unit H3B–-CO2H (with a K+ based counterion). Very intrasting ….but RCOOR is the ester of carboxlic acid…so want know , why are you called carboxlic acid..plz reply me sir..
R=H (a carboxylic acid) is declared early on. When R=Me, it is declared as an ester.